Many people at the beginning of the year propose and declare resolutions or intentions for the upcoming year. There are many ways to vision your dreams. 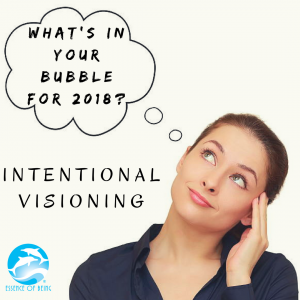 But before I go into depth about the ways to create one, you may want to ask yourself, “What’s in my bubble?” “Why should I have a vision?” The why is much more important than the how. Bubbletalk are the unconscious thoughts that keep you from getting what you want. What thoughts are blocking you and in your bubble? If you keep doing the same thing over and over again and expecting different results, you will keep frustrating yourself at the end of the year and saying, “Well this year went by fast and I still didn’t …” If what you are doing and thinking is not yielding the results you want, than it is time for a change. A change in your beliefs that you can’t have what you want. Many people are afraid of their desires and stop dreaming because they give up. I see this so much in our work with Essence of Being. People let go of their dreams because they have been denied what they want and are too tired to keep trying. We tend to give up because we feel it is no use and we don’t know how to let go of the blocks that keep us from achieving what we want. Since we don’t know how to let go of our limiting beliefs and blocks, most of us will give up on our dreams. We know how to do that! But wait! There is a graceful way out of this abyss. You can create a vision if you can hold in your heart and head a picture of tomorrow that is better than today. A vision can be defined as an intention and vibration that you set forth as a guide or a road map for you to feel and follow. The first step is to figure out what you want. Most of us know what we don’t want. Start there first. Anytime there is contrast in your life, you can use it as a signal to alert you that this is not what you choose!! From that point, your contrast will lead to clarity. I define contrast as anything that is not what you want. Once you have figured that out, it is easier to figure out what you do want. You get clear and focused on your desires. Your clarity will lead to personal power. In other words, the power to create your life as you choose is within reaching waiting for you to grasp it. You create your hearts desires by first knowing what they are and then believing you can have them. I believe it is easier to create a vision if you consider every aspect of your life: mental, physical, emotional, and spiritual. Include things like relationships, health, money, career, fun, purpose, family, and friends. One of the best ways to create a vision is to script it out as if it has already happened. Take out a sheet of paper and write a letter of gratitude to 2018 as if it’s December 31, 2018. Bask in the appreciation of it all that you created. Something like, “I am so grateful for the abundance I created this year. I met the love of my life and we traveled to Italy and my business is bringing in over $5,000 a month”. Be specific with all the details of the juicy things that happened (as if they already did)! This type of vision allows the universe to hear and know that you believe it is possible and the vibration you are sending out is one of knowing, not hoping. Your vibration is one of allowing because it has already happened. This technique is quite effective for being creative in your thought process. Dream away because you are the creator of your dreams and the master of your thoughts! Another way to create a juicy vision is with pictures and words. Some call it a “treasure map”. Kids especially love to do this. Cut out pictures and symbols and words of what you want to have in your life from magazines and glue them on to a poster board. Hang this up where you can see it everyday and allow yourself to see you actually living those pictures and words. Many people are visual learners and this technique helps you “visualize” the outcome very clearly. Creating a vision with passion is key. Whatever you do, create one that makes you feel fabulous and energized. Keep it up and in plain view everyday so that you can remind yourself of what you are creating this year (or already have). These images and thoughts create a vibration that is positive and focused on your outcome. I have done both of these techniques and 80-90% of what I envisioned, came to fruition. That is a powerful statement. If you create a strong vision of who you really are and what you truly deserve, the rewards come very easy. Dreams are a reality if you believe they will come true. As Cinderella said, “If you keep on believing, a dream that you wish will come true”.